A few years ago I needed to buy a new tent. This ended up being quite a time consuming task considering all the different models that are out there. Everyone has a different opinion about what is best and every tent has a slightly different purpose. There is no such thing as the “ultimate tent for every purpose”. So I had to define my constraints and wishes first. Be a proper two person tent. One that can actually fit two adults (who are not necessarily a couple) comfortably. Be light enough that I can carry it alone. Be long enough to fit me (I’m 194cm, or 6′ 4.4”). If possible, provide space to keep two people’s packs dry. Be suitable for all weather conditions short of snow camping. Not rely on too many pegs when pitching, which can cause problems on rocky or hard ground. Right from the beginning it was clear that this wasn’t going to be an easy task. Especially the second point, which meant it had to be about 2kg, which really is not that heavy for a two person tent (many models in this weight range are actually more like 1.5 person tents). It was also clear that I wouldn’t be able to find a really cheap tent, so I had better be careful that I made the right choice before spending my money. I started touring through virtually all the outdoor stores in Sydney’s CBD and surfed the net extensively before I made my decision. After a lot of research, I finally decided that I would get the Mont Moondance 2. Ironically, this was the first tent I was offered in the first store I went to when I started my search. Well, I could have had that easier, but thanks to my research I could be confident that this was indeed a good choice for my needs. The manufacturer provides the following specifications for the tent. 2 entrances with a vestibule each. Rated as a 3 season tent. The design is clearly similar to MSR’s Hubba Hubba, but it has a few differences. The most noticeable is that the Hubba Hubba’s inner tent is constructed almost completely out of mesh, while the Moondance has fine woven fabric about half way up to provide some more insulation. While this would seems to provide a weight penalty, the Moondance was actually a tiny little bit lighter. Also, the Moondance is a little bit longer on paper, but that is offset by the fact that the walls of the Hubba-Hubba are almost vertical whereas the Moondance comes up at an incline. This tent usually comes without the optional footprint, so if you want the footprint, you have to consider this when looking at the price. I decided to buy the footprint as protection for times when I’m car camping or similar and weight is not that much of an issue, but now I carry it on almost every trip. This hopefully extends the life-span of the tent floor. The tent comes in four parts. Firstly, there is the inner tent which is where you will eventually sleep. Then there is the outer tent, which is basically a sophisticated tarp that goes over everything to keep out the elements. To make things stand up, there is a long bag containing the poles and finally a small bag that contains the pegs. These are the parts you actually need to pitch the tent. I will discuss everything that is in the box a bit later. Mont also provides a stuff bag to put everything in. However, from my experience, this bag is best left home when space matters and the tent is actually carried around. Keeping the different parts separate allows for much denser packing inside your backpack. I usually have the poles close to my back, where my backpack is long enough, and put the rest wherever I find some gaps, as each item by itself is not bulky at all. Eventually I also bought new stuff bags for the tent. The outer tent fits nicely into the Exped Zip Pack UL (Size: S) whereas the inner tent + ground sheet + peg bag fit into an Exped Cord Drybag UL (Size: S). Together with the poles that makes three parts. The packed tent the way I carry it. Left: the outer tent. Middle: the inner tent, pegs and ground sheet. Right: the tent poles. Note: the green and yellow bags are not sold with the tent. Pitching the tint is fairly straight forward. As with most modern dome tents you put the inner tent on the ground, pitch it with the poles, attach the outer tent and finish by fixing the pegs. But there are a few caveats. First of all, one has to be aware that this tent is not symmetric. There is a clear distinctions between the head end and foot end and mixing up the two will not make you happy. I made that mistake the first time I jumped inside it in the store and it felt awkward. Luckily, everything is colour coded. The poles, inner tent and outer tent all have some very visible blue parts at the foot end where as the same parts at the head end are gray. …blue attachment points and poles are the foot end. First, you put the inner tent on the ground (if you have it, you put the foot print underneath) and then you assemble the poles. There are two poles: a very short one with only two sections and a very large four-ended one. Each end goes into a ring in one of the inner tent’s corners, following the colour coding. The ends of the poles widen a little bit, so they actually stay in place when you move to the next corner. That is very handy compared to my older tents where the poles often jumped out the moment I moved to the next corner. However, there is one nasty detail that gave me some grief in the beginning. The two hubs of the four-ended pole have special buttons on one side that attach to the inner tent. Care has to be taken to ensure said buttons point inwards. Otherwise pitching the tent is bound to fail. So not only do you have to match head end and foot end, getting left and right correct is also important. In the beginning I made this mistake a few times and had to change the poles around. Maybe Mont should have colour coded that, too. But after using the tent for a while, I learnt to get it right straight away. Next you attach the inner tent to the two hubs and attach all the hooks. As a last step comes the little pole that simply goes horizontal over the top to give the roof some more volume. This is all quick and easy. It is nice that so far everything works without having to put a single peg into the ground. I often pick up the whole tent in this state and move it around to put it exactly on the spot where I want to have it. Also this state allows for cleaning the inner tent very quickly: open one of the doors, hold the tent by the main pole near the hubs, lift it up into the air, and all the dirt simply falls out. Very nice. I wish I could clean my room at home that quickly! 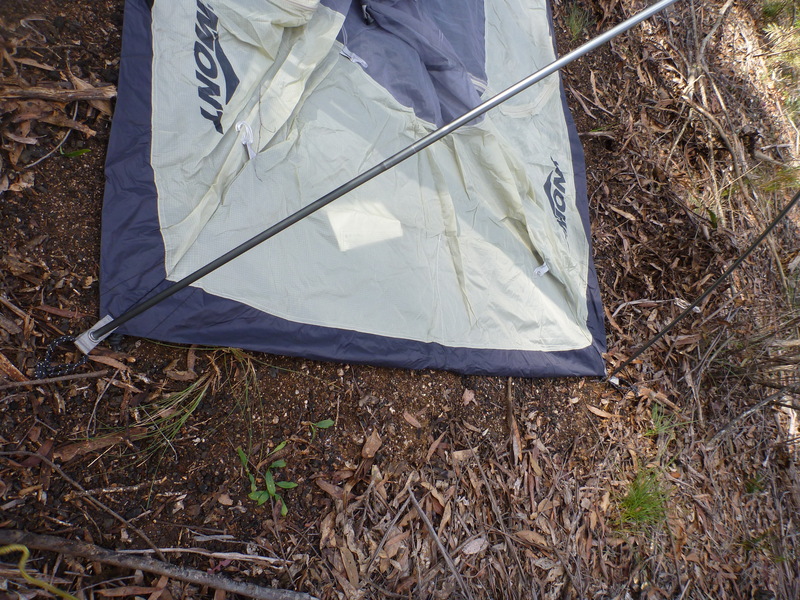 Next I usually peg down the four corners of the inner tent so it can’t move around any more. There are little rubber bands at the end that allow you to vary the peg’s position a little bit in case there is a stone, but not by much. The good news is that the tent is already quite stable, so if you can’t get all the pegs in on very hard ground you can simply omit them and still be fine. At last comes the outer tent which first attaches to the ends of the little cross pole on the roof top. This is where you probably experience the biggest design flaw of the pitching procedure. There are two rings on the inside of the tarp and each end of the pole goes into one of the rings. Everything is well measured so that it then holds with just the right amount of tension. I mentioned earlier how much I like the widened ends on the poles that prevent them from jumping out of the holes, but this small pole doesn’t have them! So when you pitch the tent alone you will probably find yourself putting the pole in on one side, walking to the other side, putting the other side in and noticing that the first side is loose again – and you can repeat that quite a few times. This is obviously not an issue when you have two people as one can be on each sides. I usually solve this problem by simply reaching across and doing it all from one side. I just manage to reach. But then I am quite a bit taller than average, so I don’t know how a small person would deal with this. I don’t understand why Mont doesn’t simply put the widened ends on the little cross pole too. Next comes the feature that most tent owners don’t even know exists, even though most tents have it in one form or another. Right where the storm lines attach to the outer tent on the outside, there is always something to attach the tarp to the tent poles. Most tents have two little bands or strings, so you have to tie a knot here. Without that, the storm lines are pretty useless. The Moondance comes with little pieces of Velcro so the attachment is very quick and can easily be done by blindly reaching under the tarp with one hand. No awkward knot tying in places you can’t really see. While the main purpose of these fasteners are to assist the storm lines, I often attach them because they also make sure the outer tent always sits properly aligned on the whole construction. 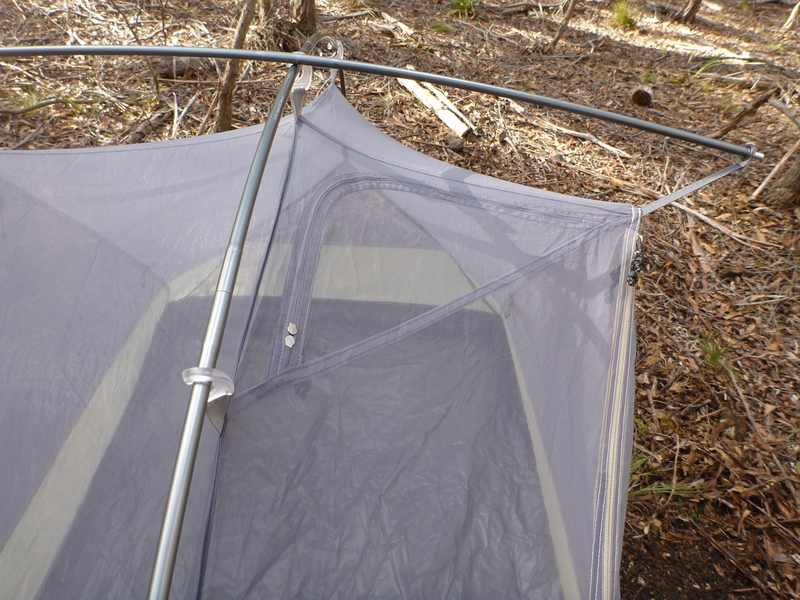 The tarp then attaches to the corners with four adjustable straps. Very easy going and the adjustment ensures that you always have just the right amount of tension in the outer tarp. Adjustable straps tighten the outer tent at the corner. Up to this point there were no mandatory pegs involved. But now come the two pegs this tent actually needs: one peg on each side (left and right) to hold the entrances and vestibules in place. This is a typical job where many cheap tents require a peg to be placed in precisely one place – and if that’s where there is a stone in the ground you have a problem. The Moondance gives you a bit of a better chance here. The loop for the peg is attached to a little adjustable strap that allows you maybe 20cm play to find a spot where you can place the peg. The same strap also allows you to adjust the tension on the vestibule after the peg is placed which is very convenient. Adjustable straps allow for flexible peg placement. There are two more pegs that are not strictly necessary, but I always place them if I can. They go in at the middle of the head end and foot end respectively and hold the tarp a bit further away from the inner tent. This is nice to have because it reduces the chance that you will accidentally push the inner tent onto the tarp and collect all the condensation that is hanging there. The pegs attach to the same kind of adjustable straps that are used for the vestibules, so there is also a bit of flexibility when placing those pegs. The last step is the storm lines. There are four of them, one on each corner about half way up. Like the name says, they are meant for strong winds. As with all tents, setting them up in good weather does more harm than good, because they are just tripwires for you and your fellow campers and in the worst case someone can damage your tent while stumbling around. The dome shape with the sides and corners pegged down is already a pretty sturdy construction, so there must really be a good storm before you will need extra stability. I’ve only ever needed to use the lines when camping in snow or alpine environments, and only once did I actually place all four of them. The tent only comes with 8 pegs, and if you’ve followed the setup so far you’ll find you’ve already used them all: one at each corner and one at each side. However, with storm lines in place, there is absolutely no reason to have pegs at the corners of the tent, as in terms of stability the storm lines supersede them. Simply remove the corner pegs and use them for the storm lines instead. After talking so much about where to use the pegs, let’s have a look at the pegs themselves. At first sight the pegs look a bit like the crappy ones that come with cheap tents and bend sooner than later. But first impressions can be deceptive. While they are very light and petite indeed, they are still all nice and straight. I have even had to drive them into the ground using stones as a hammer and, apart from the obvious scratches in the red colour, none were damaged or bent. Also, the hook at the top is designed in a way that ensure the peg never turns around or otherwise releases the string it is holding. I tried using the pegs to tighten an ordinary fly (tarp), but with that job they finally failed. Due to their small size they are unable to hold very strong sideways loads in soft soil. But, given these pegs come with a tent, not a fly setup, I can’t seriously blame them. Despite never having had any issues, I usually still carry two more heavy duty pegs with me to be absolutely sure I can always get things to hold. While I have written many, many words about pitching the tent, the whole process can actually be done quite quickly — taking only a few minutes. The peg bag, a pole emergency repair tube and the pegs. The lower half of the sides of the inner tent are made out of a fine woven fabric, whereas the upper part is made out of loose mesh. This combination gives enough protection to keep some warmth in and prevent the wind from flowing through the tent, but it still keeps the tent light. Entering the tent is easy. The entrances are big enough to slip in comfortably. And because each person has their own entrance, there is no awkward climbing across each other. Dirty shoes can be left nicely in the vestibules. The vestibules are also big enough to store an overnight pack out of the weather. So when it rains, everything is accessible without leaving the tent. A definite plus in bad weather. For ventilation, the Moondance has a little hatch in the roof. When closed, there is some Velcro to hold it shut. To keep it open there is a little Velcro attachable stick. To operate the Window, there is a flap with a zipper in the inner tent so the window can be reached easily from the inside. Of course, you can handle the window from outside the tent, too. Unfortunately, when there is a lot of rain, the water can get inside the tent when the hatch is open. So make sure to close it whenever there is a chance of decent rain fall. Otherwise you might end up with a damp or wet sleeping bag. …and the inside bit. The zipper in the inner tent allows you to operate the hatch from inside the tent. The inside of the tent is not strictly rectangular, but in a trapezoid shape, making the foot end narrower than the head end. The foot end is 111cm wide, so depending on your sleeping mats they might overlap a little when two people are using the tent. 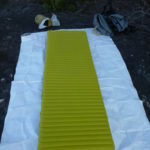 With normal mats this is not an issue, and the Thermarest NeoAir mat I use these days is only 50cm wide anyway. This might be an issue if both people use thick and wide inflatables to sleep on. But I dare say, that would go against the spirit of lightweight gear anyway. The head end is 134cm wide and thus allows enough space for two people lying next to each other or maneuvering around. The roof follows the asymmetric design as well. Most of the height and volume is provided towards the head end, allowing you to sit inside the tent. On the foot end, the tent wall is steep at first to provide maximum clearance for feet inside sleeping bags and the roof is fairly low. All in all it is a very good shape to optimise the necessary compromise between space and weight. I believe the Moondance 2 gives you just the right amount of space needed to feel comfortable and not claustrophobic while cutting the corners where no room is needed to save weight instead. So far I never had to spend a whole day inside the tent with two people. I would assume that this might get cosy over time. However, staying inside the tent for days is not the main purpose of an ultralight tent. The upper pocket is also nice for providing a light. Put your head torch inside and it illuminates the tent. This works quite well. However, when you are siting in the tent the light is behind you.For that situation there is a little loop in the roof that allows you to hang a head torch easily. Inside pockets. There are two lower pockets and a third one higher up (the opening is the black horizontal seem in the picture). The tent is marketed as a 3 season tent. Nevertheless, I have taken the Moondance on a cross country ski trip in the Snowy Mountains. The wind and snow was blowing like crazy that night and it was still perfectly warm in there. We simply used snow pegs for the vestibules and storm lines (one of the few times I used them) and built up a little snow wall to seal off the gap between the outer tent and the ground. If you were to camp in heavy snow fall, you probably have to push the snow of the roof every once in a while since it is very flat. I haven’t tried that, but as I said, it is only meant as a three season tent. It is good to know that this tent seems to be fine with anything you might encounter in Australia. When it comes to rain, I have only had the tent fail once when I had the hatch in the roof open. Otherwise it has done well. Also, when you set it up properly, there is ample space between the inner tent and the tarp to prevent you from accidentally picking up any of the condensation. The large vestibules are also a plus since all gear including dirty shoes can be stored out of the rain. I’ve also managed to cook in the vestibules during bad weather. However, I’d like to point out that this is not recommended due to the various dangers involved, especially fire hazard and gas hazard. During rain, the entrances have to stay closed. depending on how much it rains, you can open the zipper part of the way so that only the vestibule gets wet, but not the inner tent. Leaving the door wide open, as with a tunnel tent, is not possible. With respect to wind, this tent is surprisingly stable. I’ve only had the urge to set up the storm lines twice. Normally, the dome shape holds everything in place very well. In addition to the four storm lines I mentioned earlier, there are two additional attachment points for cords above the entrances, Mont does not supply cords and pegs for them, but if you really wanted, you could attach your own strings and get some spare pegs. But I suspect Mont simply came to the conclusion that the tent was already stable enough without this. They are probably right. The Moondance is also very forgiving with respect to the ground you can pitch it on. The tent is mostly free standing and the only pegs that are really required are those that hold the vestibules open. Under normal conditions there won’t be much load on them, so the demand for getting pegs into the ground properly is minimal and they can even be replaced by using a large stone or log if the ground is too hard. And even if the vestibules fail, this won’t mean the tent will collapsing on you. During night, the tent is easy to spot. The storm lines and attachment points have highly reflective elements. 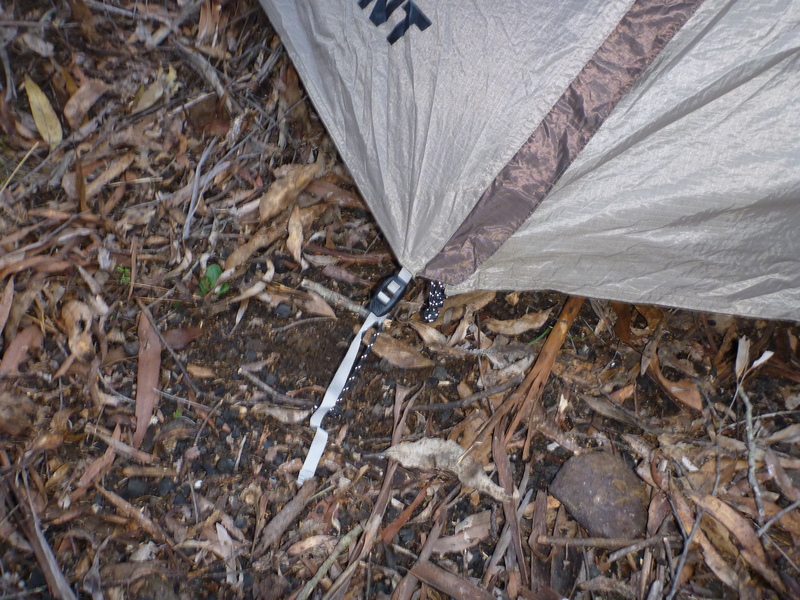 At night, when you point a torch roughly towards the tent, those pieces light up like a Christmas tree. This has proven very convenient countless times when leaving the camp fire to stumble back towards the tent late at night. Reflecting elements make the tent visible at night. Pitching the tent during rain is difficult. This is due to the fact that you normally start with the inner tent, so by the time the tarp is on, the rain has had plenty of time to completely soak the inner tent. The manual states that you need the footprint in order to pitch the tent during rain. This is indeed a solution. You can pitch the poles on the ground sheet instead of the inner tent and then set up the tarp already. Then you hook in the inner tent and you get the poles into the right holes of the inner tent in the very end. This solution however requires you to carry the footprint around at all times, which sometimes defeats the purpose of an ultralight tent. If you are in a large enough group, you can improvise. Either by people holding the poles in place manually instead of putting it into the ground sheet or by holding the outer tent as a roof while one person pitches the tent under it. But in my eyes, the owners of a tent should be able to pitch it by themselves. The box contains the obvious necessary items, the inner tent, the outer tent, the tent poles and 8 pegs. In addition, there is a small tube that allows for emergency repairs in case one of the poles breaks. For packing things up there is a fitted bag for the poles and another smaller one for the pegs. To pack the whole tent, there is also a pack sack provided, but due to its bulkiness I never use it and replaced it with the smaller bags shown above. This is the most versatile 2kg tent I have seen. Even several years after I got the tent I haven’t found a tent I would rather have (yes, I know that is a pretty strong statement for outdoor gear). Of course, everyone has different needs, but considering the constraints I formulated above, this is still the right tent for me. The good overall design idea of the tent is well complemented with many design details that are very well thought through. And so far I haven’t had any damage on the tent, apart from a single bent peg. So what are the cons? The first annoying realisation was most certainly when I found out that the footprint is sold extra and I had to go back to the shop. One might argue that other vendors do the same, but I still don’t like it. A couple spare pegs would also be a nice gesture. The bag the tent comes with is also way too bulky. The inability to pitch the tent during rain in its standard setup can definitely be a problem when the weather turns really bad. You have to consider that and either carry the footprint or work out another method. I hope Mont adds the non-slipping ends to the small cross pole at some stage. That seems like a real slip in the design. But it really only affects pitching it. Compared to the Hubba Hubba the Moondance is a lot less spacious but much more sturdy. The large volume of the Hubba Hubba leads to large surfaces for the wind to grab hold of and also to a much softer overall construction. Also the Moondance has an inner tent that is only half mesh which further protects you from the cold. Given that, I classify the spacious Hubba Hubba more of a good weather tent whereas the Moondance can easily punch above it’s weight (i.e. it braves conditions you don’t usually expect from a 3 season tent). The bottom line is that I would definitely recommend the Moondance 2 to any one who has similar requirements to me for a versatile, strong, light-weight two person tent.